We’d love your help. 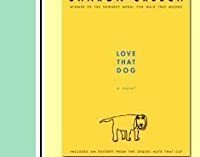 Let us know what’s wrong with this preview of Love That Dog by Sharon Creech. 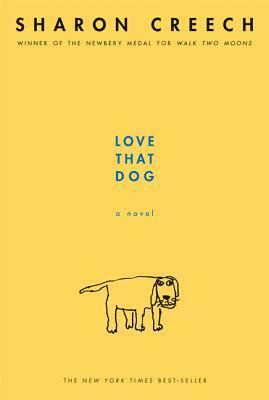 To ask other readers questions about Love That Dog, please sign up. good age group for this book? Jennifer My kids were 7 and 9 when I read it to them. They totally got it and loved it. Me too. it is so sad anyone agree? But, I was lucky to know a poet, and was lucky to read his words. His voice had the right cadence, the exact urgency , the strength to leave you breathless and make you ache. It takes an fierce will and a tremendous heart to be a poet. I like how Jack and his dad adopt a dog from a shelter/dog pound. Jack and his dog both had a great time together. It's really heartbreaking when his dog died and Jack no longer wants to have another pet because of the trauma he got from losing one. 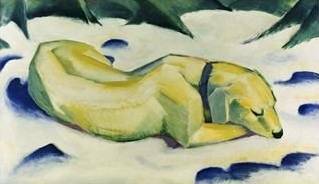 The short and bittersweet poem he wrote, in the end, is like a memorial for his dog. Before reading, take a quick look at the short poems at the back of this book because the story will make more sense if you do. I saw this book at my local library and couldn't resist the bright cover, the fact that it won multiple awards, was short-listed for the 2001 Carnegie medal and that the Guardian called it quirky, original and 'defies categorisations' sealed the deal. I later found out (after looking it up on GR) that Ms Creech also wrote Walk Two Moons, my favourite book growing up whi Before reading, take a quick look at the short poems at the back of this book because the story will make more sense if you do. I saw this book at my local library and couldn't resist the bright cover, the fact that it won multiple awards, was short-listed for the 2001 Carnegie medal and that the Guardian called it quirky, original and 'defies categorisations' sealed the deal. I later found out (after looking it up on GR) that Ms Creech also wrote Walk Two Moons, my favourite book growing up which also won multiple awards. This is an adorable story with a hint of tragedy about a boy who slowly discovers that poetry is not just for girls. He soon learns to tell his own story in the form of poetic diary entries and to write about the tragic death of his beloved dog, Sky. I also enjoyed his comment on the works of other poets e.g. Robert Frost, William Blake and others and also admire a certain poet. This book is great for reluctant young readers. initially, I got Love That Dog for my kids but it's one of those books that grow on you and before long, we were all reading and enjoying the little boy's humour and his growing confidence in copying other poets work and writing his own poetry. My Cousin actually read it to me. She used to read this to her baby girl who died of Cancer when she was 3. Today she just wanted to do something that reminded her of Anna. It was a a really cute book and I know why Anna loved it so much. I wasted 20 min of my life on this piece of garbage. Thanks Creech. When the sweet dog died. I read it in about 20 minutes. So this makes book #9. Teach More reviews at MrsReaderPants. to write a poem, too. I may even use it myself. A very very short book full of simple poems written from a 7 y/o's POV. I came across this book one day when I was really bored and had nothing to read. Reluctant to pick it up as it's a children's book, I didn't read it until I was desperate for something to do to past time. This is a quick book that can also help you accomplish your Reading Challenge. Aside from that, it was fun to return to simple language and just enjoy it. The poems were short but beautiful. However, it can let you feel. Su A very very short book full of simple poems written from a 7 y/o's POV. I came across this book one day when I was really bored and had nothing to read. Reluctant to pick it up as it's a children's book, I didn't read it until I was desperate for something to do to past time. The poems were short but beautiful. However, it can let you feel. Such simple poems can also have deeper meanings. For me, a few poems still lingered on me after finishing it. Jack, the MC, told a story of his relationship with his dog in this book, which was really sweet. He attempted to share his story through a series of poems. 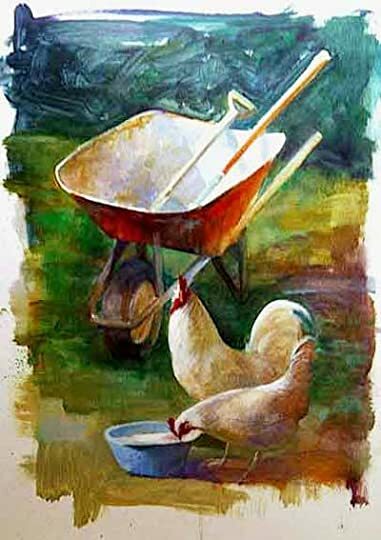 He was inspired to write poems after reading one by William Carlos Williams. Love that dog was a great poetry book. It would be a good poetry read for people who don't read poetry a lot or don't like poetry because it has an easy concept. It was easy to follow along with and it was a great read for me. I normally don't like poetry book and I didn't expect to enjoy this book as much as I did. The story to this book was very simple but it was fun to follow along with and was easy to keep track of. This is a second read-through of an entertaining and educational little book for children about writing poetry. It’s set in an elementary school classroom and begins with Jack writing a complaining note to his teacher that “boys / don’t write poetry. / / Girls do.” But, of course, it is no surprise that this boy will write poetry and at least some of it will be about a much-loved dog. Apart from the relatively thin storyline, this book makes its point about the power of poetry (and of persisten This is a second read-through of an entertaining and educational little book for children about writing poetry. It’s set in an elementary school classroom and begins with Jack writing a complaining note to his teacher that “boys / don’t write poetry. / / Girls do.” But, of course, it is no surprise that this boy will write poetry and at least some of it will be about a much-loved dog. What a beautiful way to show how a child may slowly start to appreciate poetry by trying it out himself. The development is subtle, starting with aversion (I don't want to because boys don't write poetry. Girls do. ), then copying of form, rhythm, meaningful lines from famous poets, finally first own authorship and proud signing of a poem: BY JACK! I love the fact that Jack's first poem has a secret meaning we can't grasp until he has told the story of his beloved dog at the end of Love that Book! 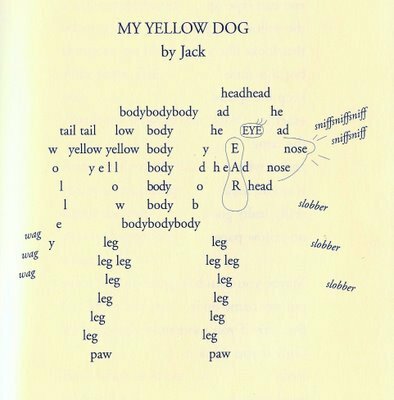 I love the fact that Jack's first poem has a secret meaning we can't grasp until he has told the story of his beloved dog at the end of the book. It is amazing to be part of his experience of William Blake's beat in Tyger, Tyger, how he transforms the wild, fearful tiger of nature into a blue, speeding car, modern and urban but equally dangerous and unpredictable. This book was, ok? I think. It definitely derived emotion in some parts, then in others it was kind of bland. Not saying it was bad or anything, just not a lot of flavor. This was neither good story telling, nor good poetry writing. This was a book I read when I was in Elementary School. I forgot about how much I loved it! Update 11/11/16: still such a great book. I love reading it and it is super quick. As I start my poetry unit with my high schoolers, this book seems to emulate all the negative feelings about poetry that my students have expressed already. As the main character gets more immersed in poetry and positive feedback on his writing, the more he learns to enjoy poetry — an outcome I am hoping my students will have too! There is a lot that could be discussed with this book (character development, imagery, form) and I think it would be a great book to start out a poetry unit. I loved i As I start my poetry unit with my high schoolers, this book seems to emulate all the negative feelings about poetry that my students have expressed already. As the main character gets more immersed in poetry and positive feedback on his writing, the more he learns to enjoy poetry — an outcome I am hoping my students will have too! There is a lot that could be discussed with this book (character development, imagery, form) and I think it would be a great book to start out a poetry unit. I love this book, it could be a great book to read before starting a poetry unit to get out all those frustrations and worries. Love the plot, the format, the messages, love it all. More like love that book... right...? In my class, we look at one or two famous poems each week. This year, before I read the book, I made sure we'd looked at every poem Creech mentions. We even wrote some "inspired by" poems of our own. It was a lot of fun and it helped A LOT when we read the book. I think the kids enjoyed the book a lot more. Will continue reading to my students. Great book of poetry and a sweet story to boot! Read it out loud to my fifth graders. They didn't seem to love it as much as the fourth graders did. Doesn't matter, I still loved it. Fantastic book! When I young my reading teacher read this book to the class and I did not appreciate the story. I thought it was a weird way for us to get into writing poetry. However, as an adult I read it to one of my students and really enjoyed it. I don't think my student understood the book or liked it as much as I did, but I found this to be a great read. The main character, Jack, hates poetry, but when his teacher, Ms. Stretchberry, won't stop giving her class poetry assignments Jack had to do them. When When I young my reading teacher read this book to the class and I did not appreciate the story. I thought it was a weird way for us to get into writing poetry. However, as an adult I read it to one of my students and really enjoyed it. I don't think my student understood the book or liked it as much as I did, but I found this to be a great read. I was completely unprepared for the emotional toll this lovely book had on me. I had tears running down my face... I giggled... I held my breath... This was an absolutely eye-opening reading experience for me. I wish that I had had a Miss Stretchberry to teach me to love and write poetry as Jack does during this book. Since I didn't have that opportunity, it makes me want to learn to be a bit more like Miss S. for my own students... If you have any other books I should read to inspire this kind o I was completely unprepared for the emotional toll this lovely book had on me. I had tears running down my face... I giggled... I held my breath... This was an absolutely eye-opening reading experience for me. I wish that I had had a Miss Stretchberry to teach me to love and write poetry as Jack does during this book. Since I didn't have that opportunity, it makes me want to learn to be a bit more like Miss S. for my own students... If you have any other books I should read to inspire this kind of teaching and writing, please share. I was born in South Euclid, Ohio, a suburb of Cleveland, and grew up there with my noisy and rowdy family: my parents (Ann and Arvel), my sister (Sandy), and my three brothers (Dennis, Doug and Tom). For a fictional view of what it was like growing up in my family, see Absolutely Normal Chaos. (In that book, the brothers even have the same names as my own brothers.) Our house was not only full of I was born in South Euclid, Ohio, a suburb of Cleveland, and grew up there with my noisy and rowdy family: my parents (Ann and Arvel), my sister (Sandy), and my three brothers (Dennis, Doug and Tom). In the summer, we usually took a trip, all of us piled in a car and heading out to Wisconsin or Michigan or, once, to Idaho. We must have been a very noisy bunch, and I'm not sure how our parents put up with being cooped up with us in the car for those trips. The five-day trip out to Idaho when I was twelve had a powerful effect on me: what a huge and amazing country! I had no idea then that thirty-some years later, I would recreate that trip in a book called Walk Two Moons. One other place we often visited was Quincy, Kentucky, where my cousins lived (and still live) on a beautiful farm, with hills and trees and swimming hole and barn and hayloft. We were outside running in those hills all day long, and at night we'd gather on the porch where more stories would be told. I loved Quincy so much that it has found its way into many of my books--transformed into Bybanks, Kentucky. Bybanks appears in Walk Two Moons and Chasing Redbird and Bloomability. Bybanks also makes a brief appearance (by reference, but not by name) in The Wanderer. When I was young, I wanted to be many things when I grew up: a painter, an ice skater, a singer, a teacher, and a reporter. It soon became apparent that I had little drawing talent, very limited tolerance for falling on ice, and absolutely no ability to stay on key while singing. I also soon learned that I would make a terrible reporter because when I didn't like the facts, I changed them. It was in college, when I took literature and writing courses, that I became intrigued by story-telling. Later, I was a teacher (high school English and writing) in England and in Switzerland. While teaching great literature, I learned so much about writing: about what makes a story interesting and about techniques of plot and characterization and point of view. I started out writing novels for adults: The Recital and Nickel Malley were both written and published while I was living in England (these books were published in England only and are now out of print.) But the next book was Absolutely Normal Chaos, and ever since that book I have written mainly about young people. Walk Two Moons was the first of my books to be published in America. When it received the Newbery Medal, no one was more surprised than I was. I'm still a little bit in shock. After Walk Two Moons came Chasing Redbird, Pleasing the Ghost, Bloomability, The Wanderer, and Fishing in the Air. I hope to be writing stories for a long, long time. I am married to Lyle Rigg, who is the headmaster of The Pennington School in Pennington, New Jersey, and have two grown children, Rob and Karin. Being with my family is what I enjoy most. The next-best thing is writing stories.